All of us get unsolicited mail and more so since the Royal Mail contracted to deliver it. Normally I just chuck it into the recycling pile without reading it but yesterday I received a really posh envelope, correctly addressed and with no outside adverts. 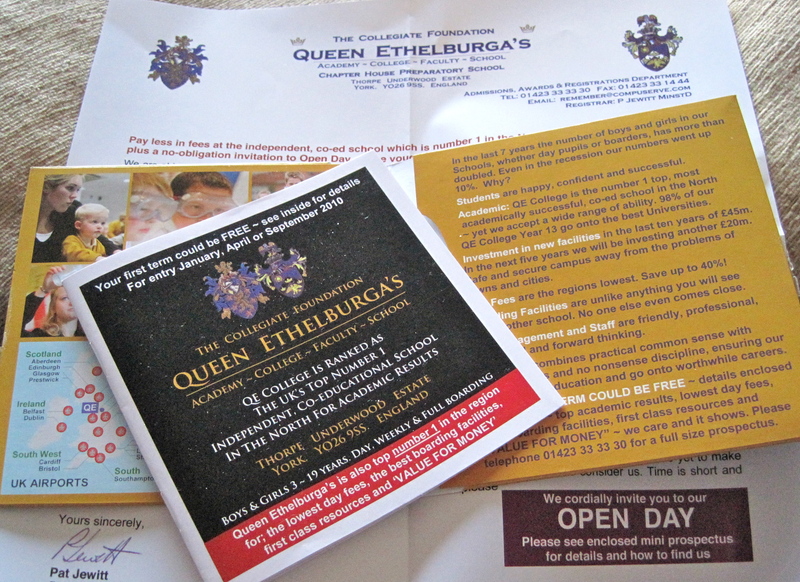 Intrigued, I opened the envelope to find it was junk mail from a private school, Queen Ethelburga’s, in York offering me free fees for one term, free uniform or free laptop. There was also a mini prospectus for the school and a CD I assume, since I haven’t listened to it, listing the many and varied reasons why I should send my kids there. As my kids are 40 and 37, I somehow don’t think they would appreciate being sent away to school, even if I could afford the enormous fees but it made me wonder why on earth I’d been sent all this stuff. I always assumed that mailing lists were used by organisations to target people who might use/buy their services/products so why am I on a mailing list used by a poncy private school. I have tried to think of stuff I’ve bought that might have propelled me onto the independent schools list but apart from buying books and toys from Amazon for my grandkids, I can’t think of anything. How many people have bought children’s goods from Amazon? Thousands I guess, so if that’s the source of the list it’s going to cost Queen Ethelburga’s a pretty penny to send out this expensive package to them all. Bloody fed up with this freeze! The ice problems of the last post, when valiant efforts by J to do the council’s work allowed me to get out of my cul-de-sac, pale into insignificance compared to what we’ve got now. The snow came again on Sunday and this time we got the full whack. The temperature hasn’t gone above zero and the road out from my house is covered in 6 inches of snow and ice so I haven’t been able to get out in the car and my normal activities have come to a full stop. OK, so I haven’t been completely stuck in the house because I have to walk the dog twice a day but that in itself is a problem. My confidence was shattered in last year’s bad weather when I slipped and badly twisted my knee now each time I set off with the dog, I feel I’m taking my life in my hands (or my feet). I go tottering out with my stick looking like I’m 106, just hoping the dog will do a poo quickly so I can totter home again. My son tells me it’s not slippy on the snow and it’s ‘all in my mind’! For God’s sake, I know it’s all in my mind but telling me doesn’t help. Now they say it could last another two weeks, I’ll be stir crazy by then if I haven’t broken a leg in the meantime!